I did a rewrite of a breaking news on the world’s top universities ranked according to reputation. 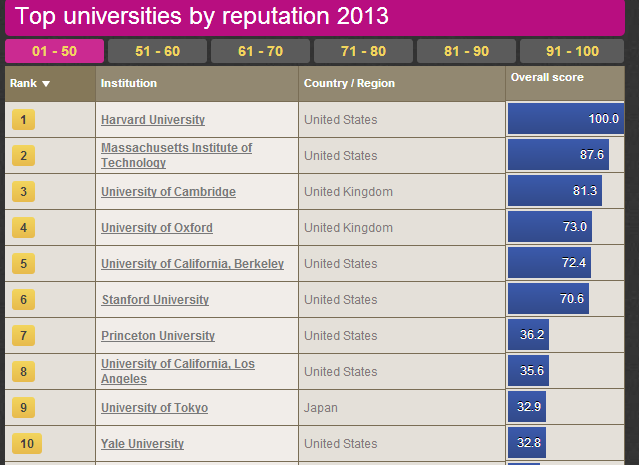 As you might have guessed, the elite “super-brand” universities from the US and UK were on top. In Asia-Pacific, Australian universities are gaining recognition among scholars. The well-known 2013 Times Higher Education World Reputation Rankings was based on invitation-only survey of opinion from 16,639 senior academic from 144 countries. On top is Harvard University, the University of Oxford, the University of California (Berkeley), and Stanford University. The top three unis from Australia are Melbourne University, the Australian National University, and University of Sydney. They say reputation is significant to universities’ success in attracting staff, students, and investment in a competitive global market. Different researches say that the brand or reputation of a university is the single most important consideration of prospective international students and academic staff. This explains the competitiveness of universities around the world in marketing their researches, facilities, student profile, faculty, and over-all image. In the Philippines, the education beat is currently filled with news of the University of the Philippines Manila student who committed suicide reported to be connected to financial constraints and forced leave of absence after failing to pay for tuition fees. There goes the world’s imbalance.